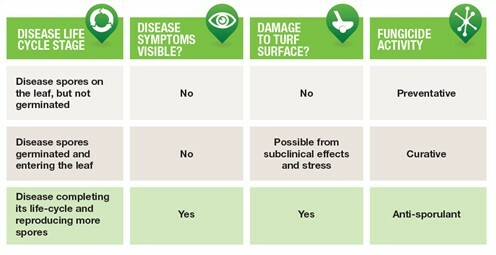 If you are looking to consistently maintain the best possible playing surfaces, clearly the best thing we can do is to control disease based on risk assessment - to prevent infection breaking out and causing any damage in the first place. Using modern technology, weather forecasts and scientific research of disease models can supplement and refine the traditional practices and skills of an experienced greenkeeper. Independent trials, by the STRI, have demonstrated that fungicide applications timed according to disease risk, using the GreenCast disease forecasting system, can maintain better playing surface quality over the course of the season, from fewer fungicide applications, compared to either routine spraying or application at the first signs of disease. The key advantage with this pro-active predictive approach, compared to routine application, is that you have the fresh application and therefore the greatest concentration of fungicide in place when the disease is most active. 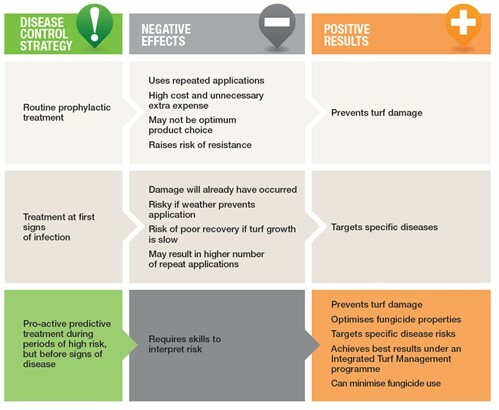 Disease control programmes based on risk applications using GreenCast also make best use of the fact that all fungicides work most effectively when applied preventatively during periods of high risk to stop pathogen spores germinating and infecting turf - protecting from damage and maintaining the best possible playing surface. Some fungicides tackle disease at multiple points in its life-cycle, and can have preventative, curative and/or anti-sporulant activity. If you know that you have been through a period of high risk but were unable to make a fungicide application, selecting a product with curative and preventative activity would be a sensible approach. Once disease has broken out into visible symptoms, it's too late for curative activity on those lesions. Also, remember that not all disease present in the turf will be at the same stage in its life-cycle. So when applying a fungicide after disease has broken out, for example, you can still achieve protection of uninfected leaves. This is essential to stop further disease spread, and relieve the stress on infected plants to enable the turf to quickly recover from disease attack. 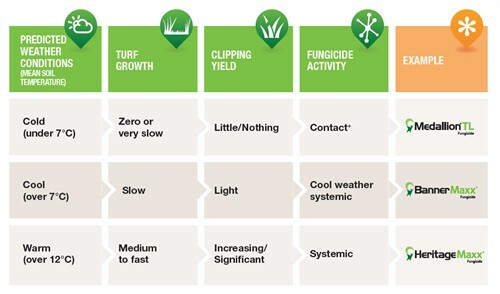 When you select which fungicide to use, it's also essential to assess the mode of action to check you are applying it at the appropriate time of year, or more precisely at the appropriate stage of turf growth. 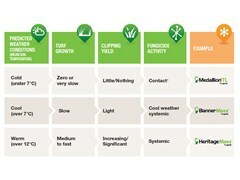 As a practical guide, you can select the most appropriate fungicide activity based on your soil temperature and grass clipping yield. Systemic fungicides should be used when the turf is actively growing. Typically we'd consider when soil temperatures are consistently above 7°C, systemic fungicides would be most appropriate. The advice is to start with a 'cool weather systemic' type of active - a systemic that is rapidly taken up, more mobile and has activity at lower temperatures, such as Banner Maxx. You can also continue to use Banner Maxx during the summer when there is a risk of disease attack and providing a valuable alternative action to the systemic strobilurins. More recently, we have seen good growing conditions continuing through the autumn and well into winter months, when a 'cool weather systemic' could still be the product of choice, even when in a normal year you would have switched to a contact. The contact-type, or contact+ Medallion TL, fungicides are best suited to cold winter conditions when there is little or no turf growth. In a winter when conditions do not rule out periods of active growth, the contact and systemic combination of Instrata provides a good alternative.